During the Golden Age of Comics, some of the most iconic superheroes ever created made the leap from comic books to the silver screen: Superman. Batman. Captain Marvel. Captain America. Spy Smasher. Spy Smasher? Yes, Spy Smasher, who had the good fortune to debut right behind Earth’s Mightiest Mortal in Whiz Comics #2, proved to be such a, er, smash with kids during the days just before America entered World War II that Republic Pictures decided to build a 12-chapter movie serial around him, just like they did with 1941’s The Adventures of Captain Marvel, still considered by most experts to be the finest example of the genre. 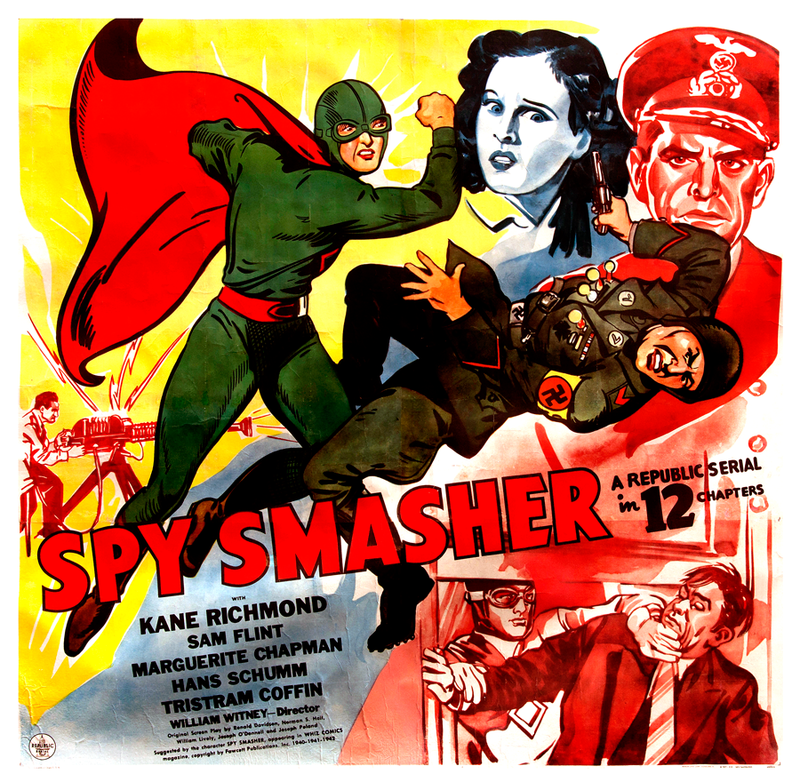 Using a lot of the same behind-the-scenes crew (director William Whitney; writers Ronald Davidson, Norman S. Hall and Joseph Poland; as well as the studio’s crack SFX and stunt teams), Spy Smasher hit movie screens April 4, 1942. Spy Smasher stars lantern-jawed Kane Richmond as Alan Armstrong, a reporter who was believed killed investigating Nazi spies in Europe. Alan decides not to dispel that notion, so he can operate independently and secretly as the masked hero Spy Smasher. Unlike The Adventures of Captain Marvel, which took a few chapters to detail Captain Marvel’s origin, this is the most we get when it comes to explaining how Spy Smasher came to be. Richmond also plays Alan’s twin brother Jack, who learns in Chapter 1 (America Beware) that his brother is alive. He, too, understands the grave threat America is under from the Nazis, and agrees to help his brother’s cause, as does his fiancée Eve Corby (Marguerite Chapman). Spy Smasher’s main foe is the Mask, a scowling, grim-faced bad guy played by Hans Schumm. The Mask’s initial plan is to flood the U.S. with phony money, thereby ruining the country’s economy. With the help of another pal, the dashing Capt. 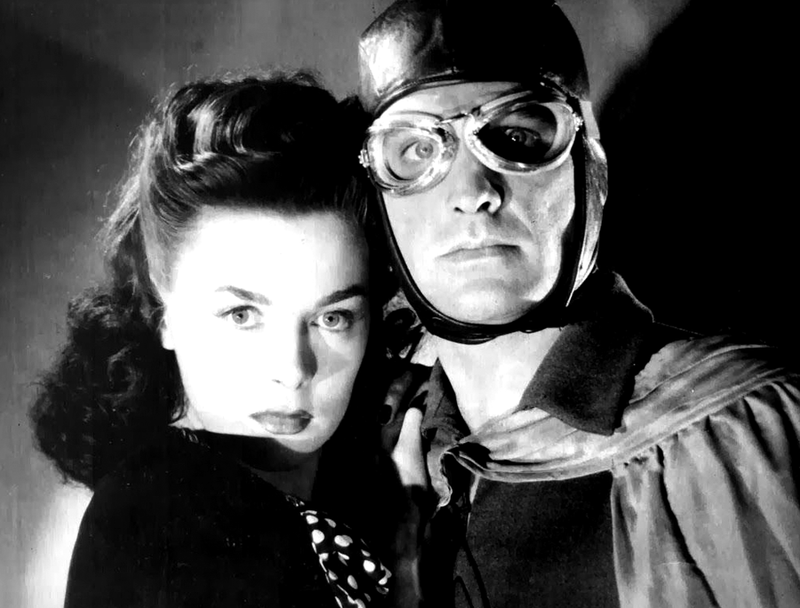 Pierre Durand (Franco Corsaro), Spy Smasher ruins the Mask’s plot, leaving the villain to try other schemes from his undersea sub, parked off the coast of the United States. Movie serials are by their nature repetitive, opening and closing each week the same way: a brief recap of the previous installment, and a cliffhanger that seemingly guarantees there’s no escape for our hero, not this time! I watched Spy Smasher for the first time just a few months ago via YouTube, as if it were one 3 1/2-hour movie. While not the ideal way to take a serial in, the fact that Spy Smasher still works so well is a testament to the job that Republic did for their second adaptation of a Fawcett Comics character. One could argue that they had a tougher job with Spy Smasher, because he has no super powers, so there’s no flying or bouts of super-strength to fall back on to entertain the nation’s movie-going kids. No, Spy Smasher, like the character itself, has to rely on its wits and grit to keep the thrills coming. In subsequent chapters, Spy Smasher keeps battling with the Mask’s Nazi henchmen, and shows a complete disregard for his (or anyone else’s) personal safety. He seems to take delight in dispensing lethal justice, like in Chapter 3 (Iron Coffin): When facing off against some Nazis in a barn, Spy Smasher fills a tire full of gas, wheels it into the barn, and then sets the trail of petrol on fire, roasting most of the bad guys inside. In Chapter 4 (Stratosphere Invaders), Spy Smasher makes use of a super-cool Spy Cycle, while trying to avoid a Nazi plane that hovers overhead. 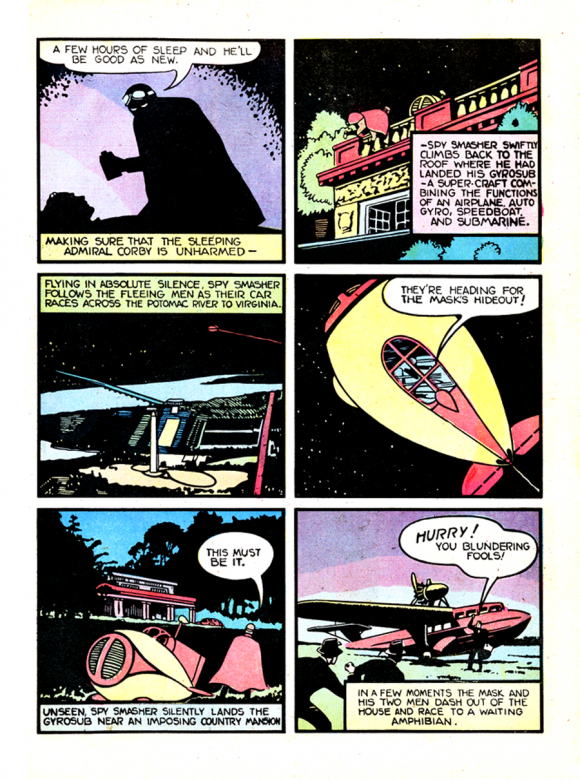 In the comics, Spy Smasher traveled in an Art Deco-style, DayGlo dirigible, one of the coolest rides any superhero has ever had, but unfortunately that was probably outside Republic’s budget, so this Nazi glider is the closest we get to aerial thrills. One of the most fun things about these Republic serials is their sense of abandon. In almost every fight, it doesn’t seem like all the punching, kicking and diving were blocked or rehearsed in any conventional sense: the actors and stuntmen just wail on each other, destroying props and essentially trashing the sets. Apparently, Kane Richmond did a lot of his own stunts, so there’s a number of fun sequences where Spy Smasher dives head first into a pile of bad guys and doesn’t stop until they’re all unconscious or dead. In later chapters, he manages to survive a plane crash, a flooded submarine, being crushed by an elevator, getting caught in the gears of a rock grinder, and an explosion. The one cliffhanger he doesn’t quite survive is in Chapter 11 (Hero’s Death), where we see him on the roof of a building when a Nazi spy shoots him. Spy Smasher falls from the building, to his death. It’s a truly shocking moment, and you wonder how Republic is going to cheat and get him out of this one! What’s even more shocking is, in Chapter 12 (V…), we learn that it wasn’t Alan Armstrong who was shot, it was his twin brother Jack, in Spy Smasher gear! Jack dies in service of his country, really adding some dramatic gravitas to the proceedings. The good guys almost never died in movie serials—they always escaped, that was the point—so this plot turn really stands out. Spy Smasher eventually defeats the Mask once and for all, and the serial ends with our hero promising to continue his mission to bring justice to a troubled world. Spy Smasher having a twin brother was an addition to the character created by Republic, and while we’re all used to comic book adaptations playing fast and loose with the source material (like the aforementioned Batman and Captain America serials), this change works quite well and I don’t think diminishes the character in any real way. His overall look, villain, and supporting characters are present, so I would argue this is one change that adds more than it detracts, especially when you consider how it was used for such a powerful cliffhanger. Republic truly saved its best trick for last. 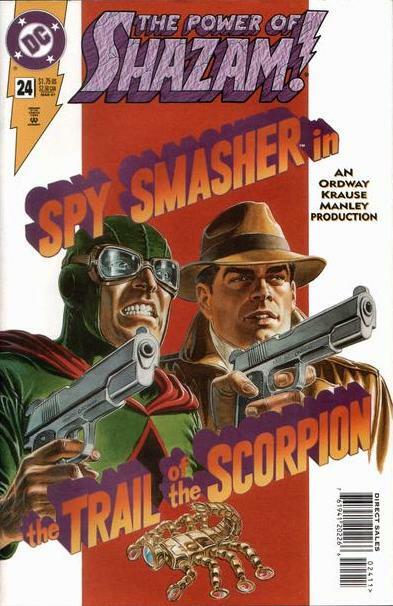 Spy Smasher continued to be a popular character for Fawcett, appearing in his own series as well as in Whiz Comics and America’s Greatest Comics, both anthology titles. After the war ended, there weren’t as many spies who needed smashing, so Fawcett tried to rework the character as Crime Smasher, which ultimately didn’t connect with audiences. Eventually, Fawcett went out of business (with a little help from DC Comics’ legal team), and Spy Smasher ultimately got scooped up — along with the Marvel Family and other characters — and brought into the DC fold. In the 1970s, the House of Superman made a big deal about their brand-new Shazam! series, but Spy Smasher only ever showed up in the pre-Crisis DCU once, making a fleeting appearance alongside Bulletman and other Fawcett refugees in Justice League of America #135, part of that year’s JLA/JSA crossover event. He didn’t appear again for decades (not even getting a Who’s Who entry) until Jerry Ordway used him in the charming The Power of Shazam! series. On the multimedia front, in the 1960s (post-Batman of course) Spy Smasher was edited down to a single 100-minute movie and sold to TV as Spy Smasher Returns. Many years later, he showed up in an episode of Justice League Unlimited, voiced by Nathan Fillion. Unfortunately, the new Shazam! movie doesn’t make reference to Spy Smasher or the other Fawcett characters. But now that they are fully owned by DC (not just licensed, like they used to be), there’s no reason why Spy Smasher can’t return to comics in his original, Nazi-smashing form. In the meantime, check out his serial on YouTube. It’s a ripping good time. — CAPTAIN MARVEL: The World’s Mightiest Superhero Serial. Click here. — CAPTAIN AMERICA: 1944’s Oddball Serial. Click here. did lobster johnson from the hellboy comics take inspiration from this?